Christian is the new kid in school. But, as a military brat, he’s used to that. Luckily, even before school starts, he makes friends, other LGBT teens just trying to make it through senior year. I hated this book. Hate that in this day and age, teenagers are still having to deal with bigots and bullies at school. My mama-heart spent much of this book pissed as hell. Pissed because the issues and concerns of the characters were a bit too real for me. Real in that they reminded me of my teenagers’ friends who are struggling with their sexuality, sometimes with little or no support at home. 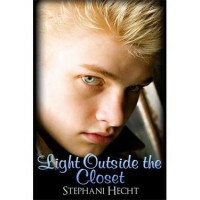 No, Light Outside the Closet is not a maudlin survey of adolescent psychology. Life Outside the Closet introduces, what I’m calling, the many faces of gay adolescence. Taylor is effeminate and “out”. Christian is out, but looks straight enough to pass. James is so deep in the closet, he’s practically in Narnia. One character is bi-racial and you might not know it, but RuPaul is the only acceptable gay man in the minds of many African-Americans. This basically is Christian’s story. Well, maybe not. It is very much an ensemble cast. Stephani did a good job introducing their world. But, back to Christian, he has a crush on James, but James’ cousin, Devlin has a crush on Christian. All very Pretty Liars. But, when James makes a decision that affects other lives, well…let’s just say feelings change. More than anyone, I think James learns about himself. And, honestly, I worried that he might not make it to the end of the book alive. This is labeled YA romance, but don’t let that stop you from reading it. The emotions are so well-written that anyone who enjoys romance will enjoy this story. So, yeah, I hated Light Outside the Closet. And I hope Stephani is cuddle up somewhere with her computer, writing book two. I can’t wait to hate that one, too. ;-) Highly recommend.